Is anyone else craving something cold? Man, it was hot this weekend and I all I could think about was beer POPSICLES. Popsicles are SO easy to make. All you have to do is mix some 100% fruit juice with some fruit and put it in a popsicle mold or a cup. You don't need fancy equipment and popsicle sticks can be found at your supermarket or crafts store. 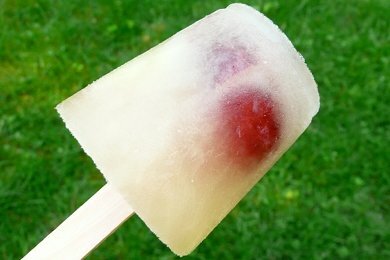 You are using the natural sugar found in the fruit juice to sweeten these popsicles and they turn out plenty sweet. 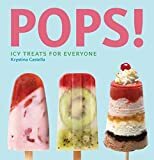 Below I have featured a book called "Pops" which is an amazing collection of ideas for making popsicles. Truly, you will be disturbed by the detail and beauty of these recipes and photos. I made these "Grape Pops" (above) with popsicles sticks that I bought from a craft store (I also saw popsicle sticks at a Dollar Store) and Dixie Cups. Place plastic wrap or foil over the cup before you put the stick in so it stays up. If you want to get fancy you can buy popsicle molds. I have included a link to the most popular popsicle molds on Amazon. I bought some EL-Cheapo ones ($4) at the grocery store and couldn't get the popsicles out of the molds, argh. If you think you are going to make a lot of popsicles, I say go with the top. Ever attempted to make your own popsicles? Please share! 1. Divide the grape halves among the pop molds. Pour in the grape juice and insert the sticks. Freeze for at least 6 hours. 2. Remover from the freezer; let stand at room temperature for 5 minutes before removing the pops from the molds. Enjoy these pops as you would a fine wine. Aw, dang, for a minute there I was excited thinking you were gonna have a recipe for beer popsicles! :( But these sound great too! I also loved the Kool-Aid popsicles Mom used to make!! I love homemae popsicles! There so yummy and easy! The hardest part is waiting for them to freeze! Honeydew is my favorite, although I have some new ideas this summer! Even better is to use coconut water or coconut milk instead of fruit juice! Not sure that I'll make popsicles, but you just reminded me that I need to try frozen grapes. I've heard that they are a great snack! Popsicles, slushies, and smoothier are all a great way to use up fruit that is almost too ripe to eat but is still delicious! I did this with a whole bunch of watermelon I had left over from a party once. I pureed the watermelon with some honey and lime juice and made wonderful slushies. I froze them in single-serve punch cups (also left over from the party). I just nuke them for about 10-15 sec to slush them up and hand 'em off to one of the kiddos for a quick afternoon treat.